The function SetStorageItems accepts an IEnumarable of IStorageItem. In this case I only have one thing to share, so I’ve just created an arbitrary list. The event handling seems a little overly complex for what it is. 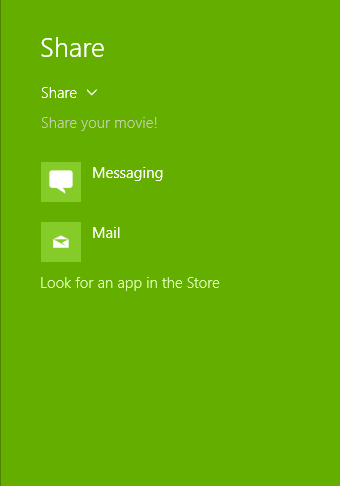 Microsoft recommend that you don’t purposely call the ShowShareUI, but there are a number of situations – for example, the share icon in the camera app – that wouldn’t be intuitive any other way (I’m no UX expert, so I’d be happy to be corrected on this). However, the share UI still behaves as though you has swiped in from the right. To be honest, I kind of expected this Windows 8 chrome to be gone for Windows 10, some is clearly still alive and well. 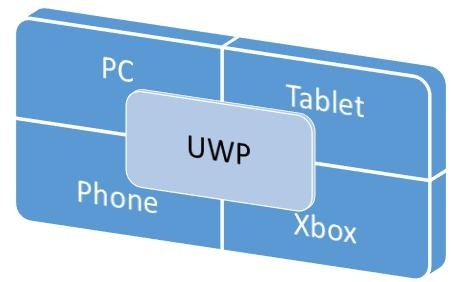 This entry was posted in C#, Universal Windows Platform and tagged c#, DataTransferManager, IStorageItem, Share, Universal Windows Apps, Universal Windows Platform, UWP on May 13, 2016 by pcmichaels. In the new Universal Windows Platform, you can store settings data in many ways. These days, there are multiple cloud options that you can communicate with; alternatively, you can store the settings in the user’s local profile. You can do this locally (that is, the data is stored on the current device against the current user only), or remotely (which means that the data will automatically be shared across all devices where your app is installed for that user). Both of these are stored as KeyValue Pairs. Local settings are small, local variables. These are accessible even offline. The following code will only work on VS2015 because of the “?.” syntax; however, a null coalesce “? ?” will work just as well in older versions of VS. There is, as far as I’m aware, no limit to the amount of data that can be stored in these settings. Take this limit seriously; this article implies that, should you exceed it, all roaming will be stopped. It’s also worth bearing in mind that you need to be online to access roaming storage. This entry was posted in C#, Universal Windows Platform and tagged 100K, ApplicationData, c#, Local, LocalSettings, Roaming, RoamingSettings, RoamingStorage, RoamingStorageQuota, Settings, UWP, Windows.Storage.ApplicationData.Current.RoamingSettings on May 6, 2016 by pcmichaels.